Rick Strassman, M.D., author of DMT : The Spirit Molecule, and co-author of Inner Paths to Outer Space, lives in Taos, New Mexico, and is Clinical Associate Professor of Psychiatry at the University of New Mexico School of Medicine. "Fascinating and provocative. A remarkable exploration of the boundaries of science and consciousness itself." "Rick Strassman's pioneering research work with DMT, a natural psychedelic drug used by Amazonian Indians, raises fascinating questions about the neurochemical basis of experience and the feasibility of conducting human research with mind-altering drugs in a university medical center. Truly adventurous reading!" "This book is essential reading for anyone with an interest in the mind, philosophy, the nature of reality, and spirituality." – Karl Jansen, M.D., Ph.D.
"DMT: The Spirit Molecule points the way beyond the present impasse of the reigning 'drug abuse' paradigm." "The most extensive scientific study of the mental and perceptual effects of a psychedelic drug since the 1960s." "Strassman's important research contributes to a growing awareness that we inhabit a multi-dimensional universe." "Strassman raises vital questions about the origin of spiritual experiences and the nature of consciousness." 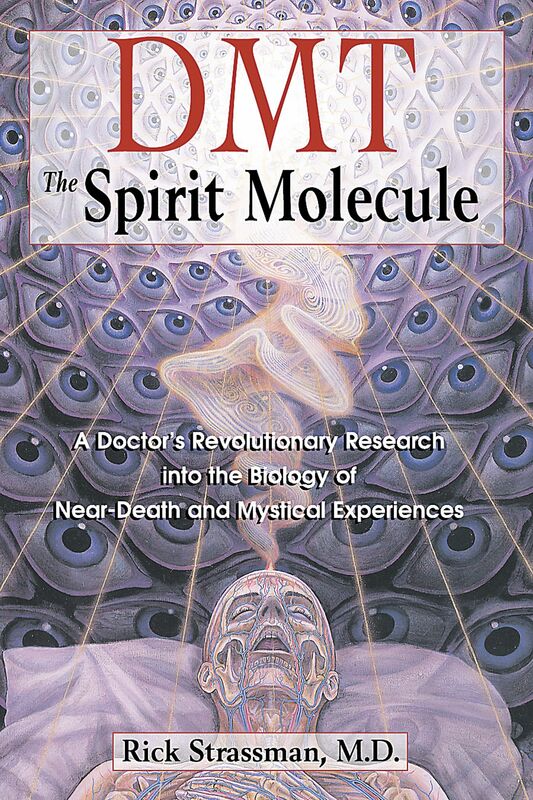 "DMT: The Spirit Molecule is a fascinating journey into the research of psychedelics. . . . The questions and possible explanations about the endogenous presence of DMT that he raises not only enlarge the discussion about psychedelics but also expand our understanding of the nature of consciousness." "This book will be of profound interest to . . . anyone with a deep interest in the study of consciousness, visionary states and/or psycho-pharmacology." "Strassman's psychonauts regularly found themselves hurtled into alien laboratories, high-tech nurseries, and Day-Glo hieroglyphic hypercubes." "DMT: the Spirit Molecule is an enriching journey into one scientist's courageous attempt to solve a bit more of the brain/mind/spirit mystery at the center of human existence." "What you will find is a thoughtful, well-written report about another of life's mysteries." "Strassman's research was an important step, one that will potentially illuminate the path for future researchers and volunteers alike, and this book is a great contribution to the ongoing dialogue surrounding psychedelics." "This is probably the most thorough book on the psychedelic, DMT--its history, chemistry, uses (legal and illegal), and its effects. This is a very compelling, thoughtful book, written by a scrupulous scientist with the soul of a meditator." "The account of the project is an excellent inside view of human drug studies, especially those with psychedelics." "This book is a highly readable, intriguing, provocative description of Rick Strassman's theories and research concerning the effects of DMT." "Rick Strassman's experimentation with the psychoactive substance DMT is taking up where Leary's 1950/60's LSD experiments stopped." "[Strassman's] account, written more for the layman than the specialist, is ground-breaking, and raises the interesting question as to what is truly a psychedelic experience." "Near-death experiences. Alien abductions. Lucid dreams. Even gods and goddesses. Try DMT for an explanation and it all holds together. It's brain chemistry. It's neuropharmacology. It's quite possibly other realms. Whatever it is, it's the new frontier, a closer examination of consciousness, and it's very, very exciting!" "[Strassman] is a gifted writer and makes scientific jargon easy to read. The book gives very interesting examples of what the volunteers envisioned and how they felt throughout the experiences. . . . It is important for us as a society to look at legal, controlled, and supervised experimentation with psychoactive drugs with open minds, and with eventual scientific benefit in mind." "Fascinating stuff! If this kind of thing interests you then pick up this book today." "In the end, I felt the most important element of the book was the contextualization of the questions most important in psychedelic research. Strassman keenly recognizes and extrapolates the areas that appear to be most vital in the further study and theory of psychedelics."